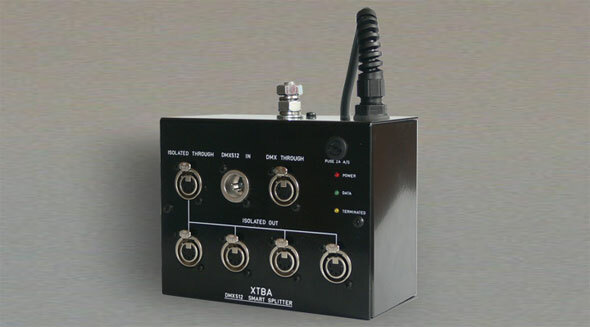 XTBA's SMART SPLITTER is designed to make the distribution of DMX512 data easy and trouble free. This model is cased in a sturdy metal case / rig box for hanging on a truss. This is supplied with a 10mm bolt for attachment to hook clamp etc. (hook clamp not supplied). The DMX512 input data is optically isolated from the output section, which divides the data into five separate buffered outputs. This allows DMX to be sent to any point without the need to "daisy chain" through all the receivers and thus simplifies cable runs and data distribution. DMX data is also looped through to an additional output so in the event of a power failure to the unit data will still be passed through. The Smart Splitter also auto-terminates the DMX line. Also available as a 1U rack mount version. XTBA declares that this equipment meets the requirements of the EMC Directive 89/366/EEC.